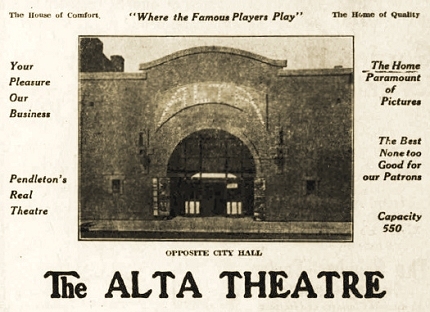 The Alta theater was created on September 6, 1913. Two days after opening the Oregonian pasted an article about the luxury of the theater. The decor inside was mentioned because of its elegance. The interior of the theater was labeled “airy” and was known for its luxury. The ventilation system was considered modern and provided a more comfortable movie going experience. Not only were motion pictures shown here, but music was also performed through out the day. A baby grand piano was installed, to provide a classy aesthetic for movie goers when waiting for motion pictures or the next performance. They also had an The then managers wife Mrs. C. E. Oliphant had music that would be played as part of the daily program. Musical numbers were also played through out films, because this was an era where silent film was the prominent film at this time. Pianist were hired to play through out every performance. The stage was 47x17x32, which was a big stage and held many high scale performances for a capacity of 550 people. When built, this was considered one of the most up-to-date theaters in Oregon. The rooms were fitted with plenty of scenery and were considered very spacious. The Oregonian goes on to call this theater attractive and has a lobby that is suitable for heavy volumes of movie posters. The newspaper speaks of this place as an attraction that gives you more than just the movie experience. This was a place of “amusement” for people.